Forgive the lighting in the following photos, it wasn't the best as I was shooting these pics. 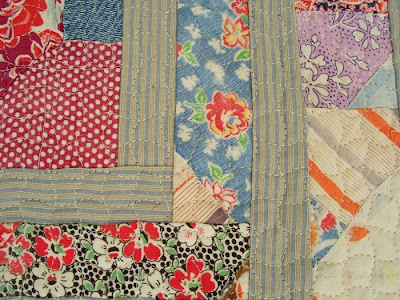 This is the first of 2 small wall hanging quilts where I used pieces cut from an old worn vintage quilt and some ticking I've had sitting around for ages. I'm participating next month in a group art show to raise money for our local Habitat for Humanity and I will be putting both of these pieces in, along with some older work. 100% of my proceeds from the show will be going to Habitat, so I hope they sell! 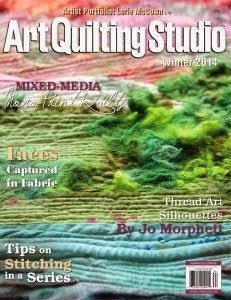 I machine quilted it in an all over wonky, honey-comb looking pattern. 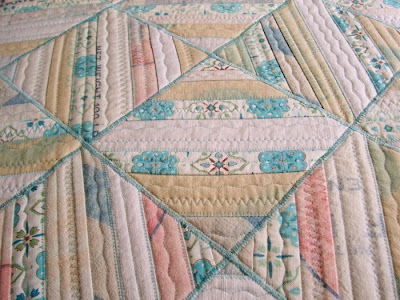 I needed to really quilt it pretty heavily as there were a lot of worn and thin areas to the old quilt fabrics and I wanted to make sure this piece was nice and stable. 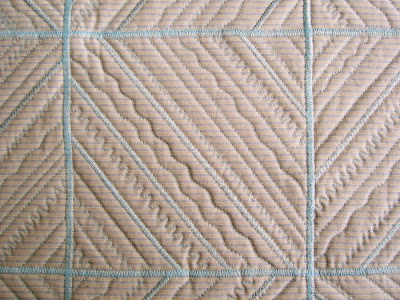 I quilted this one pretty much the same as the one before. 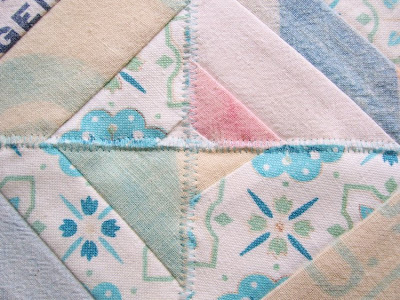 I still need to wash the quilts to soften them up a bit, and bring out the quilted texture better. This morning I went outside and found someone, (no idea who) had left, (or purposely turned on) the hose spigot. It was on full force spilling gallons upon gallons of precious water. What a waste. So I am asking myself what is up with these water leaks? I am always looking for symbols and meaning in everything and I want to know what the message for me is. What's my lesson that I need to learn? Is it the pessimistic "When it rains it pours" (so get use to it, kiddo) or what I prefer to think, the helpful reminder "Go with the flow, baby!" ... It's actually been my mantra lately, and control freak that I am, I'm trying too, I really truly am! I keep imagining myself in a canoe letting go of the oars and just going with the flow... (something I think I heard on Oprah!) And if this was any kind of test, I passed with flying colors as I stayed calm the whole time I was mopping up water off the basement floor. Now, I am hoping... no more water leaks! 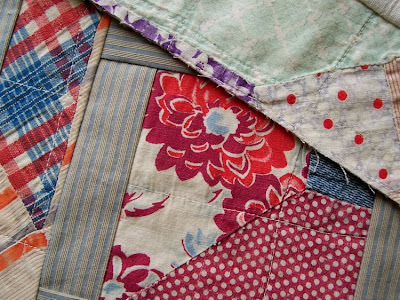 I had planned to be a sewing whiz this weekend, completing all of my unfinished quilts. Great plan but I got side tracked a bit when I slightly threw my back out, (from lifting up Molasses)... she may be short in height, but she is long in body... and 45 pounds of wiggly Molasses may be good for my soul but not for my back. All I can say is thank goodness for heating pads, pain killers and Mo's sweet face! I was determined to get something done though and did finish this quilt. It looks very nice against the bare robin's egg blue walls of our dining room, which need a little something, so I plan on hanging it there. I especially like the big F & M , (do you see it?) on one of the feedsack strips. 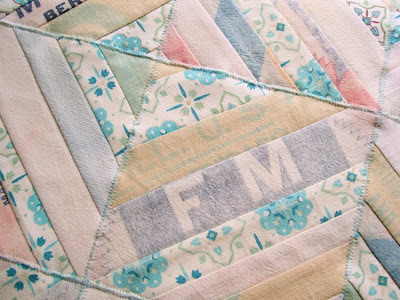 Hubby and I got married in the F & M College chapel, so the quilt has a bit of personal symbolism in it, which makes me happy! 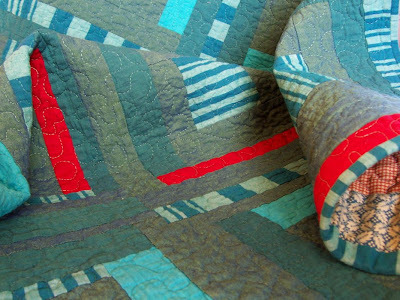 The colors in the quilt remind me of winter, so that's what I am calling it. Well, that's it. Thanks for indulging the pround Mama in me! 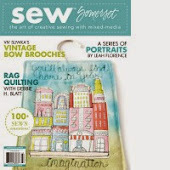 I've decided to take a long weekend, so I will be back on Monday with a new post, hopefully stitch related! If you look in between the two woman in the forefront, and past the young man with the white tie, you can see the back of my daughter. She's in the strapless black dress, with the white sash and with her back to the camera. She found this picture on line from the Washingtonian. - Hotel accommodations, not so luxurious... turned out she and her friends had to share a room with 5 other people. - Got to have hair professionally done up in a fancy do. "Inhaled enough hairspray to kill a small rodent". -Spent most of day blowing up inflatable guitars, and tying strings to hundreds of helium balloons. - Lunch was 1 sandwich shared between 4 other people. - Was given a free bottle of champagne by a passing bus boy. - Dislikes champagne, but enjoyed the added oddness to the whole situation. - Waited for gala to start. Stood in long lines. Finally got in. - Was surrounded by nice and generous people. Everyone she met was incredibly kind. - Saw great globs of wealth, and lots senators trying to dance to hip hop. - Saw Bill Murray in a plaid bow tie. - Crashed in the wee hours of the morning, sleeping huddled on the floor, just the floor, of a cramped hotel room. shared a thin blanket with her friend. - Passed lots of police, secrete service, and FBI cars all zooming by. - Made it back to college in time to watch the inauguration on the T.V. - Had an experience of a lifetime. - Went to the last class of the day, an art class, where she got to meet her new professor, a british woman who used the word "flummoxed". This made eldest daughter very happy, for two things she dearly loves are words, and a good british accent! All in all, my daughter said that if she had to sum up in a sentence what an inaugural gala is like, it would be an "Alcoholic Prom For Adults"! I would have loved for her to have been able to stay for the actual ceremonies, but at the same time I was worried as to how they would ever get back home, with all of those people jamming the roads, (along with lack of any decent sleep). So when I finally heard that they were all back in Pennsylvania safe and sound, the mom in me was very relieved! As for me... I teared up plenty watching the events unfold on T.V. What an amazing time in our nation's history. PS. 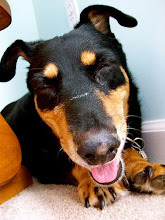 Molasses my dog, is still hanging in there, bless her soul. She has been having some various problems though and we had to take her in to the vets today for some antibiotics, as she has some skin infections due to her suppressed immune system. He is utterly amazed that she is still here with us. I am so grateful. She still enjoys eating, and playing with her toys and loves going outside and walking around the yard. I haven't been able to sew this week, as I am spending time with her. We have always been close the two of us, but the time we have spent together over the last couple of months has brought us closer then anything I can adequately explain. She is my hero. I will try to get back to the sewing hopefully today, or sometime this week, as I'd love to have something new or finished to show on my blog here... but if Mo needs me to just hang out with her, well I know you all understand. We finally get to shed the old and embrace the new. I am full of emotion at this most historic day. I have also had the added pleasure of getting to enjoy some of the pre-inaugural celebration thrill ride, by living vicariously through my eldest daughter. She and a group of her best college buds got to attend the Illinois State pre-inaugural ball in Washington, D.C. last night! They all happen to be good friends with the daughter of the gentleman who was in charge of organizing the bash. This connection got them all a gig helping to set up yesterday for the evening gala, which was held at the luxurious Renaissance hotel. 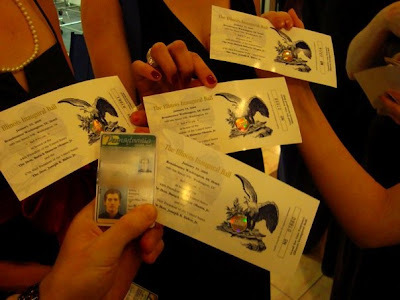 In return for their work afterwards, they all got to put on their fanciest black tie attire and be guests at the ball! They even got to spend the night as guests! We spent yesterday eagerly awaiting each text message received on youngest daughters phone, (I admit that the art of texting alludes me, and my phone is so old I don't think you can text on it!) After about 12 pm they got fewer and far between, and by 1 pm, well I imagine she was so caught up in the whirl wind of excitement that she was too busy floating on cloud nine to remember even how to text! Who can blame her!?! So I don't know much at this point except that she was staying on the same floor as Anderson Cooper. He passed by her in the hall! She has promised me photos of the nights festivities, and I'm keeping my fingers crossed they turn out. She wasn't sure if they would be able to stay for the actual ceremony today, I hope that they can. What a thing to experience! I am so thrilled that my daughter got to be a part of this. It was her first time eligible to vote, and she worked tirelessly helping to register others. Obama becoming President of the United States is bigger and more full of hope and promise, then anything else I have ever witnessed in my life. 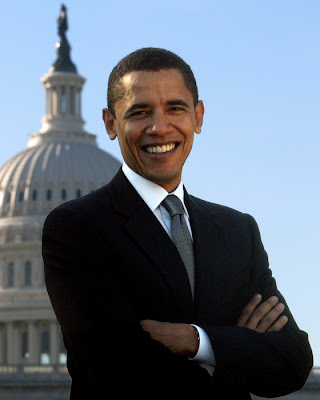 I hope that each of us will be inspired to help him on this most difficult path, doing what we are able to, in order to help restore America to her full potential, and to once again be a beacon of light, and hopefully a true messenger of peace and goodwill, in this worlld. UPDATE: She and her friends were up for 22 hours. 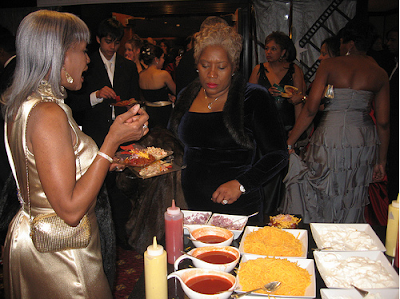 Both Michelle and Barack Obama were at the gala, as well as Oprah and Stevie Wonder, but alas they didn't run into them in person. They did get to see Bill Murray though, and they think Maya Angelou. People were taking their pictures as they went into the party, thinking my daughter and her friends were famous, (little did they know!) All in all it was a surreal and extremely glamourous evening, one that she and her friends will always remember and treasure! Hope everyone had a lovely weekend. It is freezing cold here in Pennsylvania, so I stayed holed up indoors... as I have stated before, I am not a fan of cold weather! Here's what I have been working on this last week... everything pictured below is in one stage or another of its creation, and all are awaiting completion. 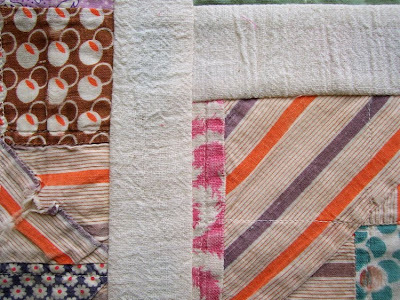 I have been playing around decontructing and reconstructing a rather thread bare and worn, but visually intriguing vintage, (crazily pieced) scrap quilt that a friend gave to me. Here, in the picture above, I am using the most salvageable parts, adding ticking fabric for the sashing. I've done the same thing with this piece above, but have used muslin from a vintage feedsack for the sashing instead of the ticking. 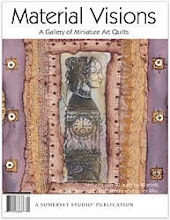 Notice in this picture the vintage quilts very worn areas, (click on the pic for a better view.) 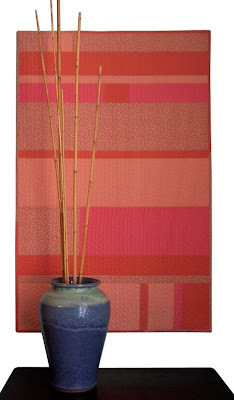 I have decided to keep them in as a way of honoring the fabrics journey. 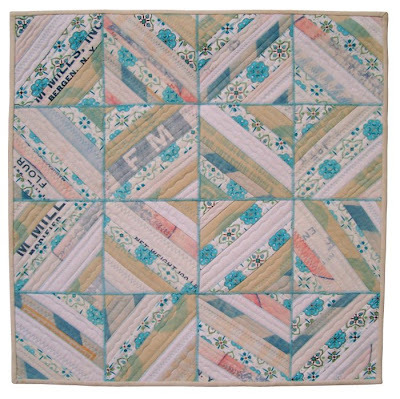 The photo above is of a string quilt which I am making from strips of vintage feedsacks. 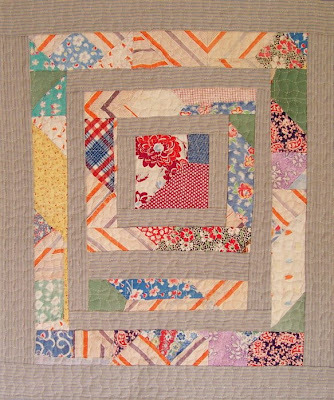 I am basically constructing it the same way that I constructed this other quilt. 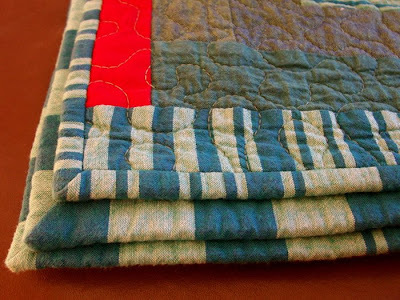 It's an unorthodox way of quilting, and I am sure some quilting purists would frown upon my method, but it works for me. I start with a roughly cut piece of batting, in this case apx. 6.5", and sew my strips directly on to the batting, placing one on top of the other. Then I trim the sewn piece of batting to a nice straight square. 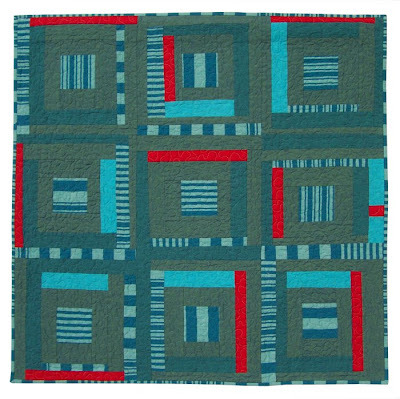 When I have all of my small squares sewn, I then take two of them, butting there flat edges up against each other, side by side, and join them with a zig-zag stitch. After the whole top has been put together in this fashion, I then place the backing fabric behind it, pin baste it and machine quilt it, (something I have yet to do on this particular one). This method might look a bit rough around the edges for some folks, but visually I think it works well with the vintage feedsacks. 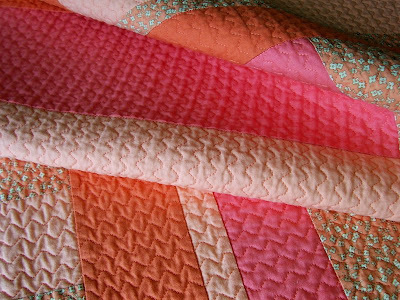 I applied the same method here to completely different style quilt, but on that quilt I covered up the zig-zag stitching with strips of folded fabric, creating a sashing effect. 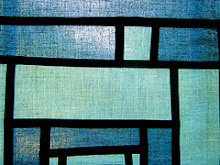 Above and below are two more "String Studies" all quilted and waiting to be bound. 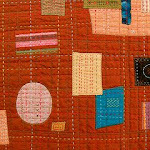 Another small scrap quilt exploring line, color and texture. 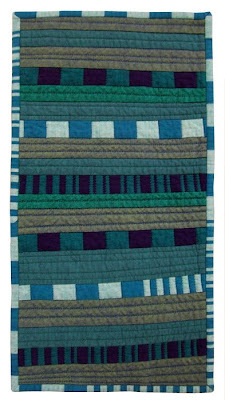 This String Study Art Quilt measures 8 1/4" x 15 3/4" and is available here. ... The answer is No! I, at this time can neither afford one, (even the poor man's version) nor do I have any room to set one up in my pretty cramped abode. (Just ask my poor neglected beautiful floor loom, sitting alone and unused, folded up in a cramped section of our cold... very, very cold, basement. If there's no room for her, there's no room for a longarm!) 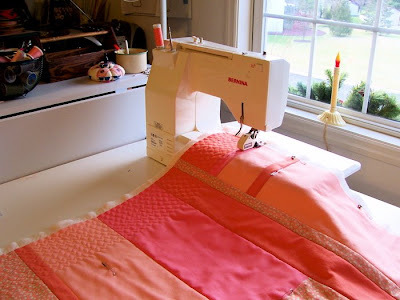 I do all of my sewing and quilting on my trusty 12 year old Bernina. A discontinued, (but once top of the line) model #1630, which in my humble opinion was the best model they ever made, and I love her dearly! 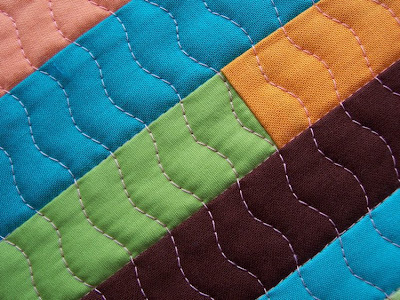 Anyway, for this quilt, the stitch length was switched to a 2 and stitch width kept at a 5. This minor adjustment made a completely new stitch. 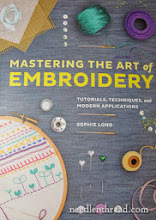 Now of course your machine is likely different then mine, but I would encourage you to play around with different stitches, and variations on the width and length settings and see what you come up with. 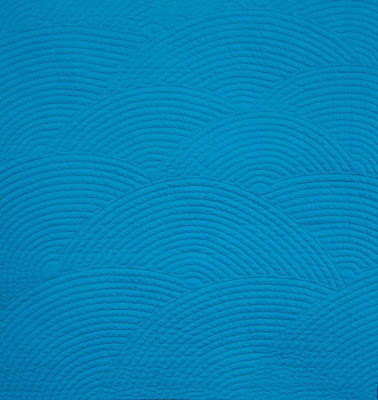 By the way, I used a walking foot when quilting this. 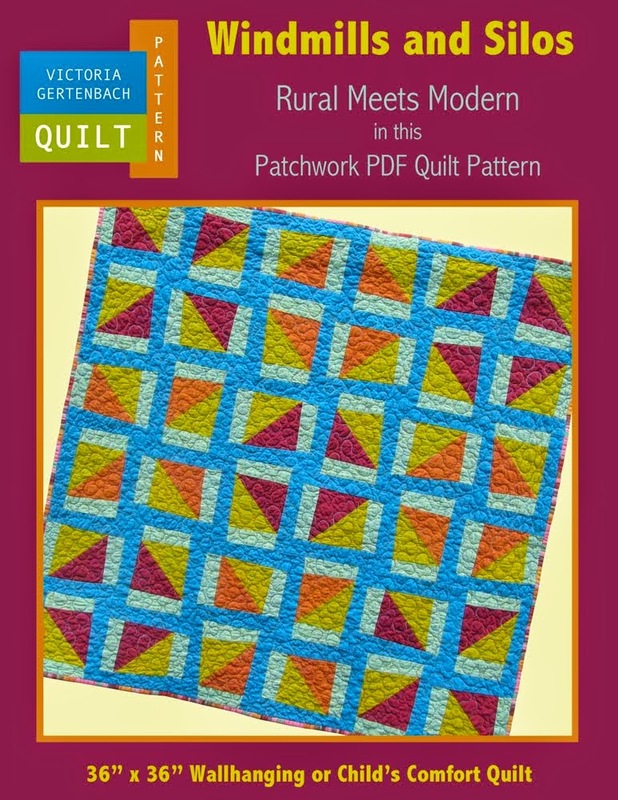 Anytime I do any standard machine quilting... (other then free-motion quilting which is when you use a darning foot, set the stitch length to zero, drop your feed dogs and go baby go!) ... where the fabric travels in a straight line under the presser foot and above the feed dogs like in regular sewing, I use a walking foot. 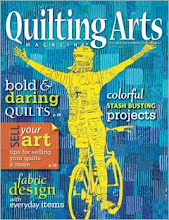 They run about $100.00 for a Bernina. 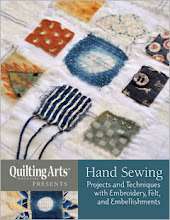 (Bernina attachments ain't cheap!) 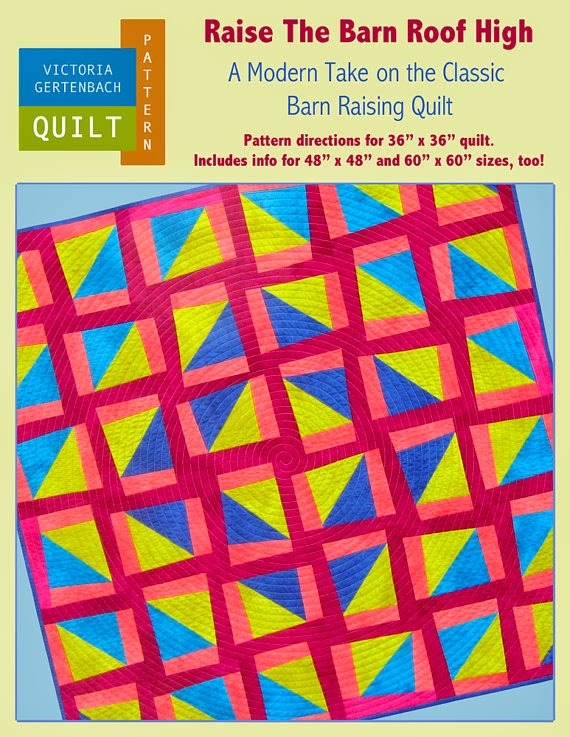 The investment is worth every penny though, as a walking foot enables all 3 layers of the quilt; top, batting and backing, to be fed evenly through the machine. 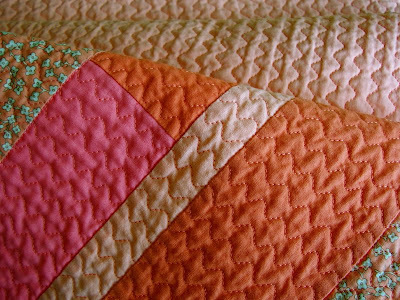 If I were to use a regular presser foot, the layers would feed unevenly, causing a sloppy quilting job, with puckers and folds. This is my latest piece. I find it very calming and decided to call it "Early Sunday Morning". Sunday mornings around my home are generally very low key and easy going. Early in the morning there's a feeling of tranquility which even seems to translate into the light that shines in through the windows. 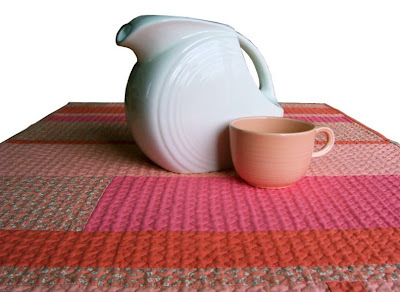 I get the same feeling from these gentle shades of coral and pink. 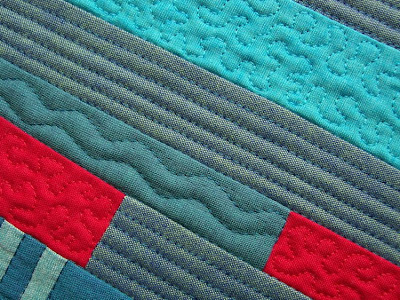 I love how the quilting turned out. It was one of those splendid accidents. I had just oiled my machine and was sewing a piece of scrap fabric through, something I always do after an oiling... it helps to get all of the oil distributed... and my hand accidently hit on a stitch that I never use, and as I moved my hand away I wound up accidently swiping the stitch length control. Because I was just doing maintenance, I went ahead and started stitching on the scrap fabric... And to my delight I loved what I saw being stitched! Amazing what a little adjustment in stitch length and width can do. 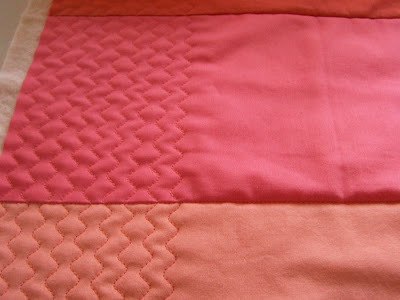 Note to self: Explore more stitches and variations of the stitches on sewing machine. I am putting this one in my functional art quilts category, because I think it works equally well on the wall and on the table. 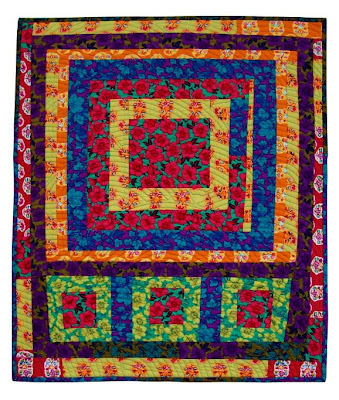 Note: This quilt has been sold. 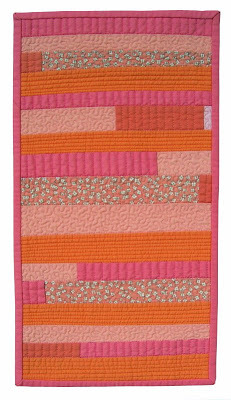 For the Project Improv charity block donation, each participant was asked to pick one of three color combinations, (red/aqua, blue/green, orange/pink) and construct an 12.5" x 12.5" improvised log cabin block... obviously based on the pics below, I picked orange and pink! 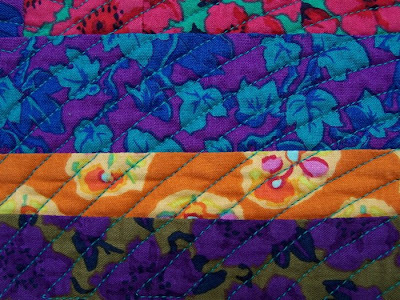 The batik prints and colors used in 2 of these blocks are so bright I almost feel like I should wear sunglasses! My current projects are in more muted colors, so when I started pulling fabrics from my stash to construct these, I tried going for just the opposite. I decided to go ahead and construct 3 blocks, just in case they could use some extras, plus it gave me a good excuse to play around with different ways of construction. 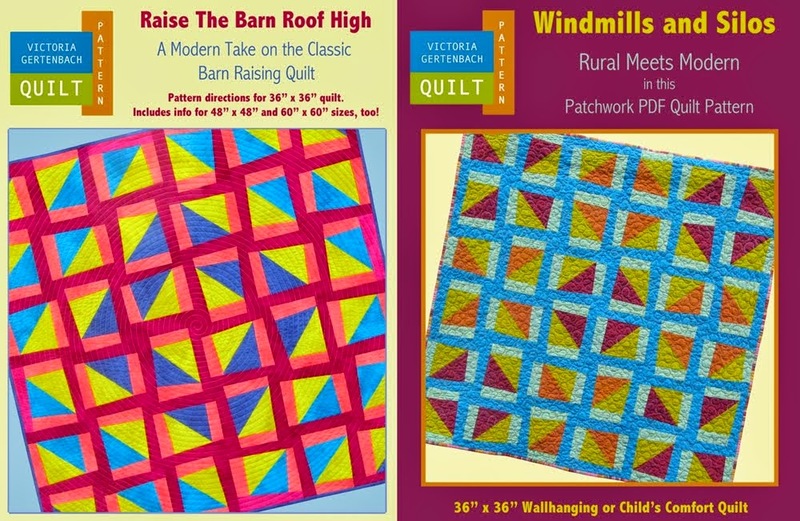 I read that Jackie of Canton Village Quilts, and a friend of hers have volunteered to do all of the quilting on their longarm machines for free. 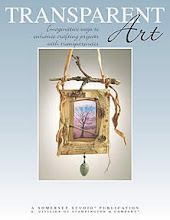 My hat's off to them, the other volunteers, and especially Jacquie of Tallgrass Prairie Studio, the brains and energy behind this project. I am continuely humbled, (and shamed a bit, too!) by people's energy levels and true generosity. 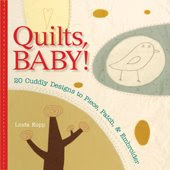 In an on going effort to use up my leftover scraps, I have begun making little quilts such as the one shown here. 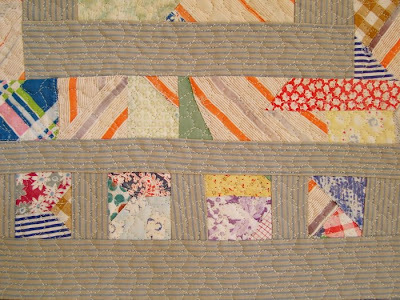 I always have left over strips, and small pieces of batting laying around, and they lend themselves wonderfully for making little "string" pieced quilts, which give me a fun and safe place to explore line, color interaction and various stitching ideas. 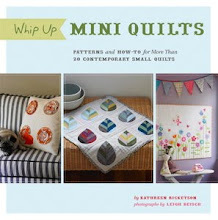 Plus I love to work on a small scale! 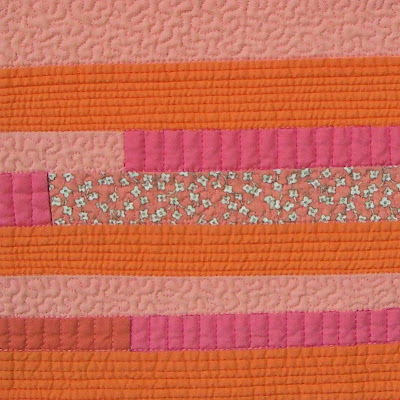 This Small String Study Art Quilt measures 8 1/4" x 15 3/4". Perfect size for a small space that needs a little something! 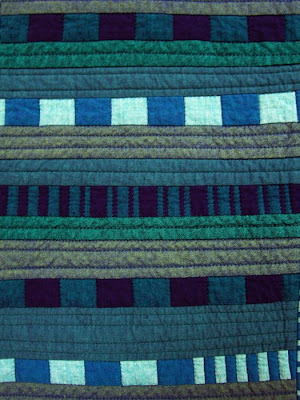 Last month, when I finally got to see the quilts of Gee's Bend up close and in person, I was most delighted and energized to see how freely the quilts had been built. 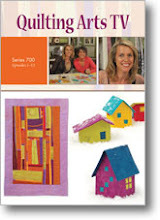 The Gee's Bend Ladies sometimes compare constructing a quilt to building a house. 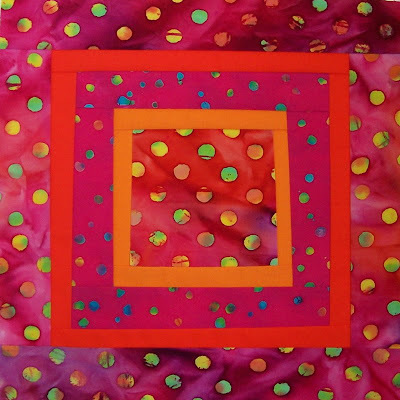 Lots of the quilts began with a square or rectangular piece of fabric. This would be the base, or foundation of the house. Strips, (like walls) are added to all of the sides. 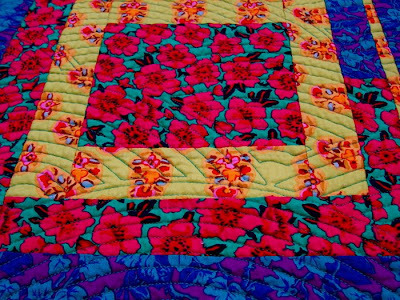 And from there more is added... a bit of this and a bit of that... building the quilt up... no pattern... everything improvised. 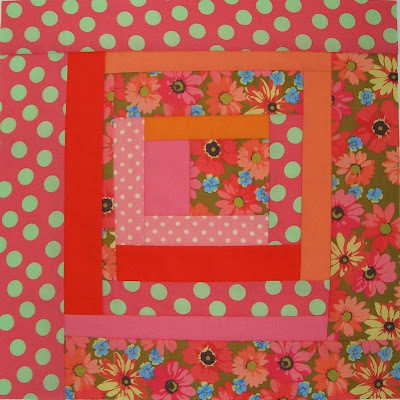 Keeping those Gee's Bend quilts in mind, (specifically the one's which started with a basic squarish shape) I began to construct this Flower Garden Art Quilt. 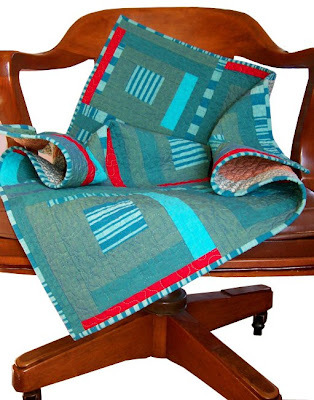 I decided to only use scraps of fabric which were left over from some previous projects, and made a pact with myself that once the scraps were used up, I would stop... and that's just what I did! 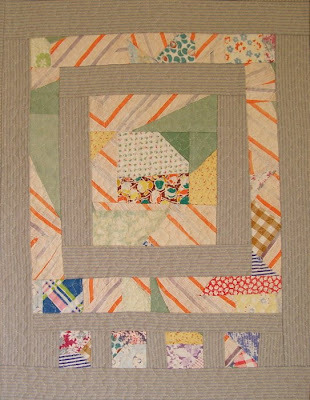 I started with the center square, next added on the strips, and just kept building and adding until my scraps were used up. 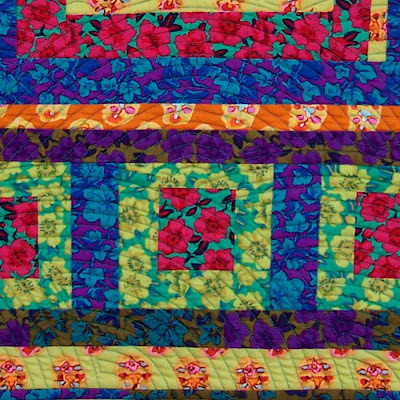 I also noticed upon observing the Gee's Bend quilts, that the hand quilting on the pieces were often done in arcs. 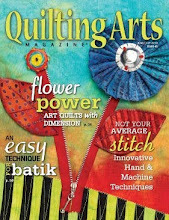 I decided to also quilt this piece in arc shapes, but used machine quilting, as that's what I perfer. I would absolutely love to see the creativity that could come from every sewer if patterns were thrown out! Just imagine the wonderful array of originality in design and construction that would be unleashed on the world! Yay! 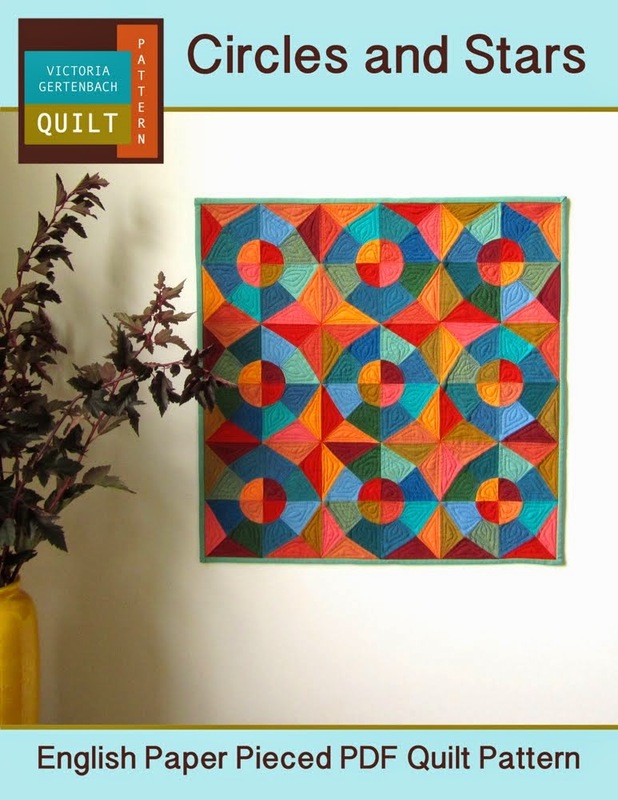 Over the holidays I did find time to finished the quilting and binding on the quilt from this previous post. I've named her "Study in Blues and Red". 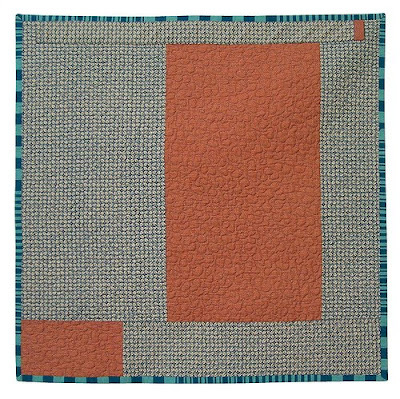 This utilitarian inspired modern art quilt is available in my shop for anyone interested! 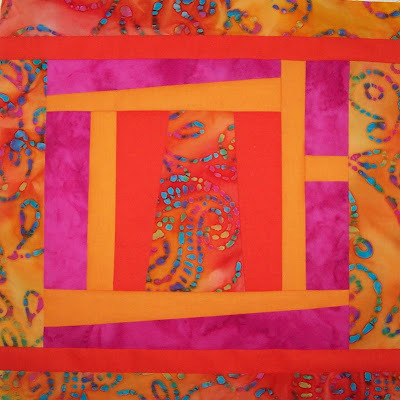 ~ Exploring more with color interaction, construction and quilted stitch. ~ Simplifying the creative process by not over thinking everything, and allowing things to come together in a more random way. I hope to be creating and posting lots of new work throughout this year, (I have some more pieces already finished and waiting patiently in line to be photographed) and am looking forward to discovering what I learn and where it takes me! New Years and new beginnings are so exciting, don't you agree?! PS. 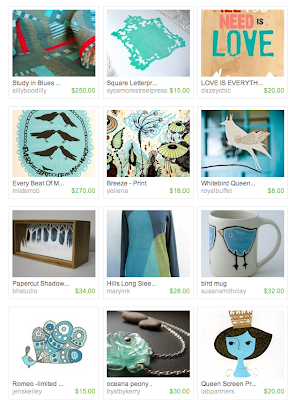 Don't forget to help save Handmade for our Children! 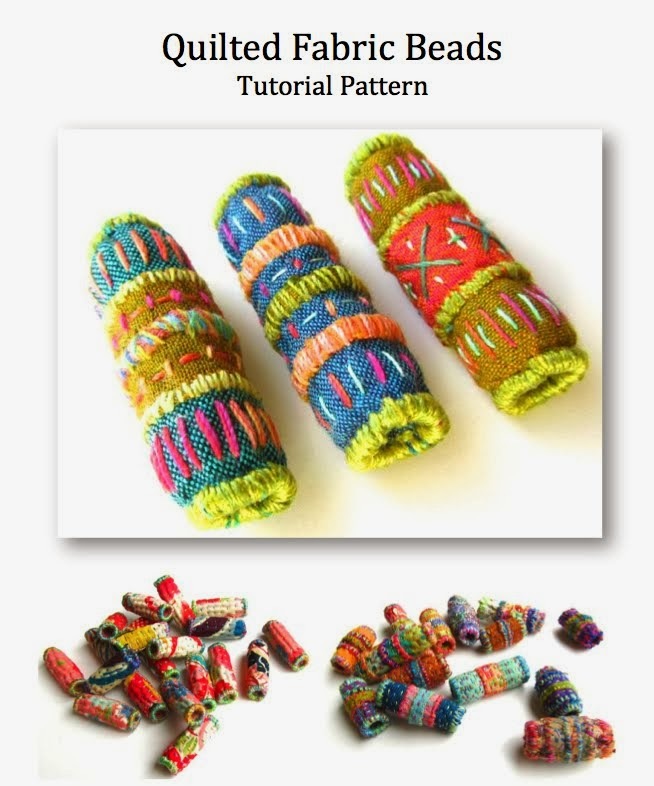 Check out my last post for more information, or click on the Handmade Toy Allowance link on the right. Hope everyone's holidays have been lovely, meaningful, renewing, inspiring and enjoyable. Ours has been all and everything mostly due to watching and caring for Mo. I am so grateful to say that she truly has been our Christmas miracle, defying all medical prognosis and teaching us that we really don't know a damn thing! She has gone from laying at deaths door to carry in the morning newspaper through our front door, (something she use to take great delight in but hasn't done in sometime, so seeing her do it once more the other day was extremely heart warming.) 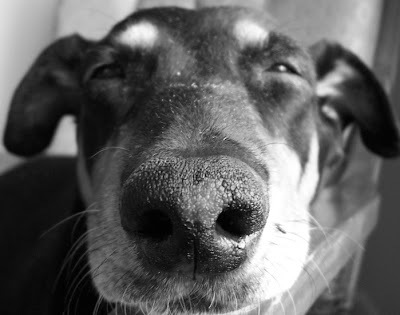 I do not know if it has been the power of love, everyone's prayers and good wishes, the St. Francis charm around her neck, or just her invincible spirit that keeps her going. Maybe it's all of it combined. Suffice to say, my cup runneth over with gratitude.